Oil on canvas board, 14 x 18 in. 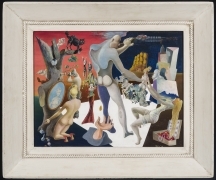 Capital Minus Labor was among the twenty-one works featured in Guy’s one-man show at the Boyer Galleries in New York in the spring of 1939. 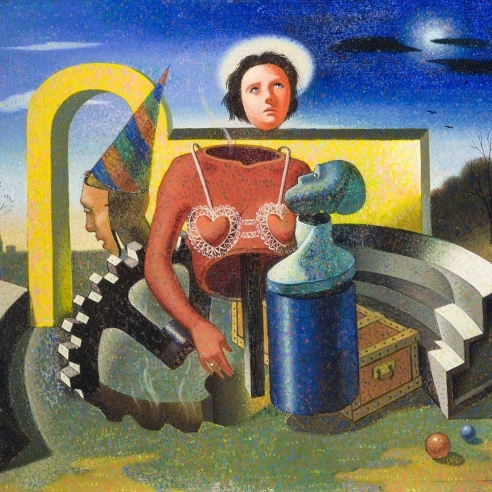 The numerous commentators who reviewed the exhibition included an unidentified writer for the progressive, leftist-oriented journal Direction, who noted Guy’s ability to synthesize the pictorial concerns of Surrealism with his desire to create paintings that “bristle with human and political significance” (“Cultural Front,” Direction 2 [July–August 1939], p. ). The same penman also noted Guy’s penchant for titles that provided clues to the jumble of disconnected motifs in his paintings (naming Capital Minus Labor among them), and he likewise observed that Guy’s “draughtsmanship and color enable him to get away with any meaning he chooses to give his provocative canvases” (“Cultural Front”). 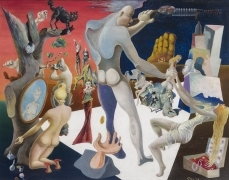 Guy’s biting social content, as well as his inventive composition and precise execution, would surely have been among the qualities that appealed to the work’s first owner, David Burliuk (1882–1967), the Russian-born futurist painter who exhibited with Guy at the Boyer Galleries and at Philip Ragan Associates in Philadelphia. (See Modern American Paintings, exhib. cat. 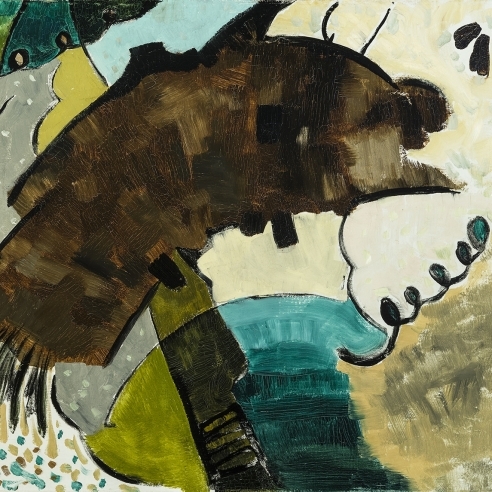 [New York: Boyer Galleries, 1939] and Paintings: Three Contemporaries, exhib. cat. [Philadelphia: Philip Ragan Associates, 1943].